Representatives from EMES are playing key roles in a new Horizon 2020 project researching the intersection of social enterprise, social innovation and rural action. 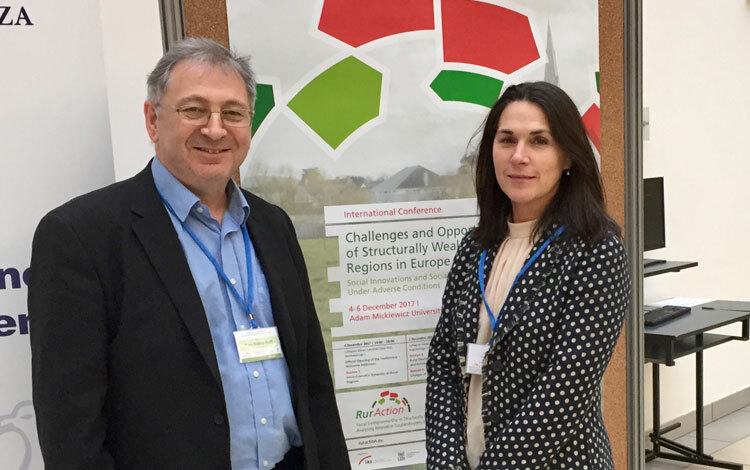 Two EMES institutional members (CSE at Roskilde University and CCS at University College Cork) are partners in the project to study Challenges and Opportunities of Structurally Weak Rural Regions in Europe RU. 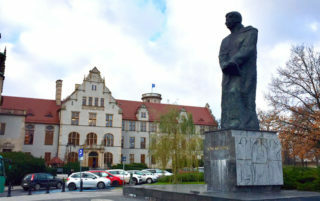 The new project is led by Prof Gabriela Christmann and Marie-Julie Jacquemot at the Leibniz Institute for Research on Society and Space (Germany). The project’s first conference was organised by Prof Tadeusz Stryjakiewicz, Dr Lukasz Rogowski and Wojciech Dyba at Adam Mickiewicz University in Poland (4 – 6 December, 2017). There is a clear connection to the work of EMES in the project. This event was titled ‘Social Innovations and Social Enterprises Acting Under Adverse Conditions’ and the opening keynote was provided by EMES’s newest Institutional Member (Sheffield Hallam University). Dr Rory Ridley-Duff used EMES’s framing of the social economy and linked it to UN sustainable development goals to provide a context for further presentations by Prof Ewa Les (University of Warsaw, Poland) and Dr Prezemyslaw Nosal (AMU, Poland) on the Polish social economy. Some highlights of the conference included presentations on advances in social innovation at the Columba River Gorge (by Darren Nichols, Portand State University, USA) and creative cultural spaces in Austria (by Martin Hollinetz, OTELO eGen, Austria). Darren Nichols work united 13 villages through the OneGorge project to prevent the closure of a bridge that would have damaged a fragile rural economy. It catalysed new forms of community action in partnership with the local university to bring resources to the rural communities of Portland. Martin Hollinetz described the opening of, and impact generated by, a network of innovation spaces gifted by local municipal authorities in Austria, Italy and Germany to local people. In one case, children ‘played’ with 3D printers to catalyse a viable social enterprise that now exports 3D printing technology to other parts of the world. There were fascinating contributions by Ariane Sept (Technische Universitat, Germany) on ‘going slower’ as a social innovation and Prof Marc Redepenning (Otto-Friedrich-Uniersitat, Germany) on ‘spatial semantics’. In the case of the former, conference participants talked about ‘deceleration’ as a social innovation to understand the Cittaslow movement of towns. They seek to create an improved quality of life by countering the ‘acceleration’ embedded in modern lifestyles. In Marc Redepenning’s work, the concept of ‘spatial semantics’ was deployed to describe the social construction of norms in the way we give meaning to (and therefore use) social spaces. This connected well to the earlier presentation by Martin Hollinetz, who described how spaces gifted to a community without preconditions give it new meaning and enable residents to experiment more freely with community activities and project ideas. The conference ended with a field trip to a social cooperative in the rural commune of Wagrowiec. This brought home the challenges of living in post-communist Poland after the collapse of many state-run farms. This rural district has created a social co-operative to provide employment for 30 people. The picture that emerged was one of concurrent top-down activity (by officers of the municipal authority and commune) and bottom up initiatives by founder members to create products and services for a local factory alongside cleaning and gardening services for municipal premises. Whilst we found that new employees are not members of the cooperative, there are founder members who bring in support from municipal authorities to sustain the project, create employment and organise education pathways for people marginalized in the labour market. The field trip gave meaning to the papers at the start of the conference on human geography (by Dr Karoline Dmochowska-Dudek, Prof Jerzy Hanski and Prof Tadeusz Stryajakiewicz). They each highlighted different issues faced by rural regions, particularly in the east of Poland and the ‘inner periphery’ spaces between cities in west Poland. The project will fund research into the role of social enterprise and social innovation in rural regions for the next three years. Ten PhD students have received bursaries to enrol full-time on PhD programmes in seven partner universities (from Germany, Portugal, Poland, Greece, Austria, Denmark, Ireland). We look forward to welcoming them all into the EMES research community at our PhD Summer School in Marseille (June 2018) and next EMES International Research Conference in Sheffield (June 2019). We would like to thank Dr Rory Ridley-Duff for this account of the event and RurAction!